This past week thanks to Pinterest I decided to make a bedhead and as I was making it realised I could do matching bedside tables from 2 old wooden crates I had. These crates had been used before, one as a toy box and the other as a desk, but they had not been used for a while and were sitting in the garage. I used 1.5 crates, laquer and nails all from our garage, so the it was all free. I made the bedspread too, but need to do the other pillow case and the European cases to complete it. I will be raising the bed head when that is done. This is a close up of the bedside table. I am considering putting a basket or something under each one for storage. I really love how it all turned out. The room is not finished, it needs to be painted (half done), and I plan on varnishing the inside of the other crate used in my old desk so it can be a book shelf in the corner of my room. I can't wait to do that. 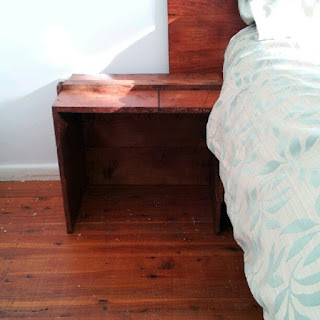 I also worked out how to turn an old pine single bed we have sitting in the garage into the dining table I have always wanted, so I am looking forward to doing that and sharing it too. Unfortunately, I sprained my ankle badly last night and the Dr said 1 week bedrest, so no projects, but I do have loads of tutorials from make-up to craft to share on here, which I will do this week. 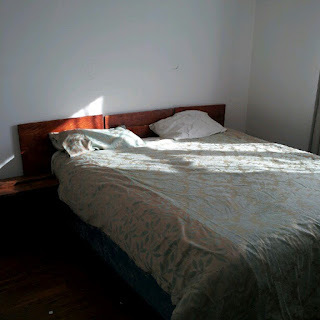 I do have pictures of the steps I took to make the bedhead and bedside. I'll be sharing a how to once I transfer all the pictures, so hopefully tonight or tomorrow. Now, since my room is not complete, I would love opinions on what I should put above my bedhead (or anything else if you like). I have 9ft ceilings, so the walls in our house look big and bare a lot of the time. Thoughts? great idea!It looks nice in this room.